Honda's Trash and Diaphragm pumps are designed for job sites and high volume applications. HEAVY-DUTY 4 IN. CONSTRUCTION TRASH PUMP: Specially designed for job sites and applications where high volume trash water capacity is needed. EASY STARTING HONDA OHV COMMERCIAL ENGINE: The durable Honda GX series commercial grade engine is easy starting and provides ample power for the toughest conditions. 423 GAL. 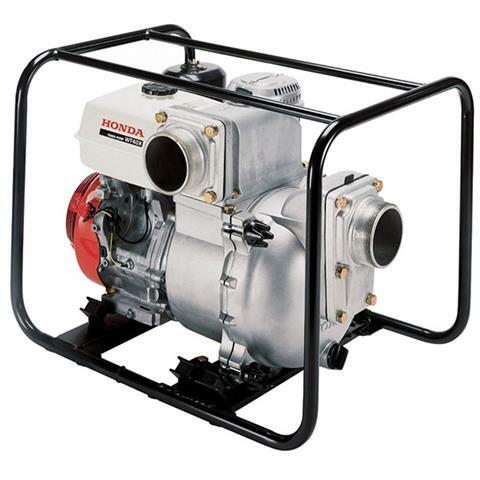 / MIN CAPACITY: The WT40 moves the most water out of any Honda pump. SOLID HANDLING CAPABILITY UP TO 1 1/16 IN. : The specially designed impeller allows solids to pass through easily, without clogging. HEAVY DUTY FULL FRAME PROTECTION: Protects the pump, while offering a convenient tie down location for transport. EASY QUICK CLEAN OUT PORT: The WT40 is designed for quick and easy service. An easy access service port makes clean-out quick. REPLACEABLE STAINLESS STEEL WEAR PLATE: The volute is equipped with a replaceable stainless steel wear plate, which increases durability and reduces maintenance costs. STANDARD SERVICE TOOL: A convenient multi-tool is provided for easy removal and installation of the pump case, for tightening and removal of the priming plug and drain plug, and for tightening and removal of the hose coupling. DURABLE SILICON CARBIDE MECHANICAL SEAL: Features abrasion-resistant silicone-carbide seals for extended wear. CAST IRON VOLUTE AND IMPELLER: The rigid-mount cast iron volute reduces case wear, increasing the life of the pump. ISOLATION MOUNTED ENGINE AND PUMP: High performance mounts minimize vibration, keeping the pump from “walking” away or “burying” itself in soft soil conditions. The reduced vibration also reduces wear on components, increasing the pump's durability. UNIQUE CONICAL SHAPED IMPELLER: The unique shape improves priming and higher discharge capacity. Wide vanes are designed to resist wear and maximize durability. LARGE HEAVY DUTY METAL STRAINER: The strainer allows up to 1 1/16 in. solids to pass through, as well as a large volume of water, helping to prevent clogging. Made of steel to withstand tough conditions.